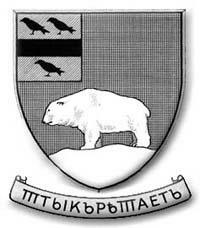 the official publication of the "49th (West Riding) Infantry Division Polar Bear Association" of Great Britain. Statues of polar bears are not very common and those which are commissioned for a military memorial are even rarer. The National Memorial Arboretum in the Midlands of England at one time was home for such a monument that was near and dear to the readers of this newsletter, while a similar, yet older, monument can be found at the White Chapel Cemetery near Detroit, Michigan, USA. Surrounded by fifty-six graves of fallen brothers-in-arms, this white marble statue depicting a snarling polar bear, frozen forever on a black granite base, was dedicated on May 30, 1930 by members of the Polar Bear Association. This Association was formed in 1922 by veterans of the American Expeditionary Force North Russia (AEFNR), who fought alongside the British, Canadian and French against the Bolshevik Red Army in 1918 and 1919 near Archangel, Russia. Memorial Day, May 26, 2003. In addition to the American Expeditionary Force that was already making its way to the Western Front, U.S. President Woodrow Wilson created two additional American Expeditionary Forces in July of 1918. Responding to requests from the British and French governments, Wilson agreed to a limited American participation in the Allied intervention that was just underway in Russia. Accordingly, the AEFNR and the American Expeditionary Force Siberia (AEFS) were quickly organized by the United States Army and sent to Archangel and Vladivostok, respectively. Before recounting the actions of the Allies in Russia, an explanation of the reasons behind the Allied intervention in Russia is in order, beginning with a recollection of the significant events that occurred there in 1917 and 1918. In March 1917, the Russian Czar Nicholas II abdicated the throne and was replaced by a provisional democratic form of government, which pledged to continue fighting the Germans on the Eastern Front. However, their ill-fated offensive of June 18, 1917 eventually stalled and the poorly armed Russian Army was overwhelmed in the resulting German counteroffensive. This was the end of fighting on the Eastern Front, and the war materiel being supplied by the Allies quickly began piling up in Archangel and the ice-free port of Murmansk. In October 1917, Vladimir Lenin and Leon Trotsky led the successful revolution that overthrew the provisional government and placed the Soviet communists in power. They eventually negotiated the Treaty of Brest-Litovsk with the Germans and formally ended the war on the Eastern Front in March 1918. The spring of 1918 found the Allies in need of a new strategy. With no Eastern Front, the Germans could now redeploy those troops to the Western Front. The elite Czech Legion, which had been fighting the Germans alongside the Czar’s troops, had withdrawn to the interior of Russia along the Trans-Siberian railroad and was being prevented by the Soviets from making their way to the Western Front via Vladivostok in the Far East. The Soviets were expanding their control to the outlying provinces of Russia and their Bolshevik Red Army was growing in strength. with the Bolsheviks took place. mounting an offensive that would reach a spur of the Trans-Siberian railroad at Kotlas, thus enabling a rescue of the Czech Legion. General John J. Pershing, the commander of all American forces in Europe, had just received the Allied Intervention directive from President Wilson and decided to change the orders for the 339th Infantry Reginment, the 1st Battalion of the 310th Engineers, the 337th Field Hospital and the 337th Ambulance Company. Instead of continuing to the Western Front with the rest of their 85th Division counterparts, these units were designated to be re-equipped and re-trained before joining the British and French Allies in Archangel as the American Expeditionary Force North Russia. Once the AEFNR soldiers had settled into camp, the American "doughboys" were dismayed to learn that their Enfield rifles which they had learned to use and trust during basic training at Camp Custer, Michigan, were to be replaced by Moison-Nagant 7.62mm Russian rifles. During their three-week stay in Surrey, the 339th infantrymen at least had some time to learn how to shoot with their new and inferior rifles - unlike the machine gun crews who just prior to departure had to exchange their guns for unfamiliar air-cooled Lewis and water-cooled Vickers machine guns. The newly-minted AEFNR soldiers also had to exchange their US Army gear for British-issued clothing and winter equipment. 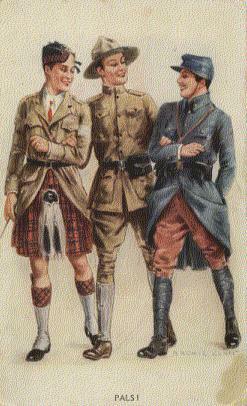 The summer of 1918 in England was a scorcher and the new wool uniforms itched unbearably. The men were also issued "Shackleton Boots", a large boot with thick leather soles which worked fine for Antarctic exploration but would soon prove to be unsuitable for infantry use. During their training in England, they also got their first taste of British rations, including mutton and canned "M&V". Despite all of these changes, the 5,000 men of the AEFNR remained in high spirits and enjoyed their brief stay in the green countrysides of England. On 25 Aug 1918, they boarded trains for Newcastle-on-Tyne, where troop transport ships were waiting to take them to the wilds of Russia. The troops in North Russia, in the winter of 1918-19, were equipped with certain additional articles of clothing designed on the same principles as those used on Antarctic expeditions. Among these were what were known as "Shackleton boots," large canvas boots with thick leather soles. These boots were not at all suitable for walking on hard snow, being very clumsy, and they were very unpopular with everyone. The late Sir Ernest Shackleton was sent out by the War Office to give advice on matters of clothing, equipment, and so on. When he arrived at Archangel he went up to a sentry whose beat was in front of a warehouse about three steps up from the road, and said to him, "Well, my man, what do you think of the Shackleton boot?" To this the sentry replied: "If I could only meet the perishing blighter wot invented them I'd very soon show—"
Before he could complete the sentence his feet, clad in the ungainly boots, slipped on the frozen snow, and slithering down the steps on his back, he shot into Sir Ernest and the two of them completed the discussion on Shackleton boots rolling over in the snow! At the end of the December 2004 installment of this article, we left the 5,000 men of the American Expeditionary Force North Russia (AEFNR) as they were boarding transport ships at Newcastle-on-Tyne. Promptly at 5:00 AM on the morning of 26 Aug 1918, tugboats guided the British troopships Nagoya, Tydeus, and Somali away from the docks and they were soon headed out into the North Sea. Their voyage to Archangel was relatively uneventful, at least with respect to enemy U-boats and the weather. By the fifth day at sea, every available bed on the Somalia was occupied by soldiers who had come down with a case of Spanish Influenza. Many others who were also infected but had a lesser fever were confined to their hammocks or laid about on deck. The influenza bug struck nearly as hard at the passengers on the Nagoya, while the men on the Tydeus managed to avoid the epidemic. By the time the little fleet had sailed up the Dvina River and anchored off the city of Archangel on September 4th, the ship's medical offices had long since exhausted their meager supply of medicine. It took two more days to negotiate and prepare hospitals on shore before the approximately 175 seriously ill men could be debarked. The first death came within hours after they were brought ashore on September 6th and by September 30th a total of 63 American soldiers had died from the "flu". By then, the flu epidemic had peaked and while there were only a handful of later deaths from disease, about 60 influenza invalids were evacuated to hospitals in England during October and November. The AEFNR force of about 5,000 enlisted men and officers who were deemed fit for duty, disembarked between September 5th and 7th. They joined some 6,300 Canadian and British soldiers plus about 1,600 French troops who were either already in the Archangel region or well on their way. 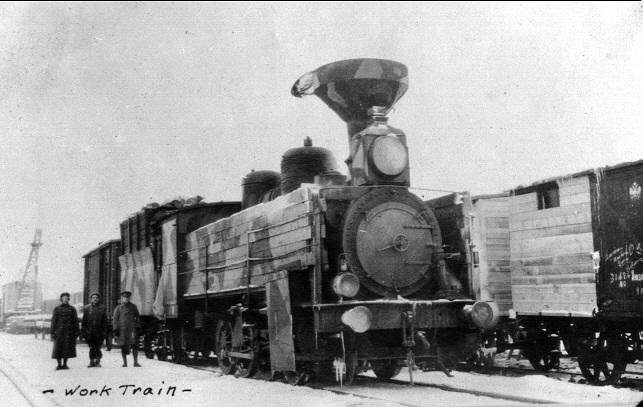 The Third Battalion of the American 339th Infantry (Companies I, K, L and M) was first off the ships and they were immediately loaded into railway cars and sent south along the Vologda Railroad to relieve a small band of Allied forces who had been engaging Bolsheviks forces for the past week. The Second Battalion was assigned to barracks in Archangel and given security duties in the city. On the 7th, the First Battalion transferred onto barges which would take them further up the Dvina River. The men of the 310th Engineers were quickly scattered about in support of the 339th, building blockhouses and bridges, running the sawmills and laying out the American Cemetery in Archangel to receive the influenza victims and war dead. The entire Allied military operation in North Russia was under the command of British Major-General F.C. Poole. He and his staff, along with a partial regiment of 1,700 French soldiers and a small number of British soldiers and American sailors, had arrived in Archangel on August 2nd aboard a tiny armada of a dozen or so British Navy ships and armed trawlers. This show of force convinced the remaining Bolshevik forces in Archangel to beat a hasty retreat down the railway line towards Vologda and up the Dvina River towards Kotlas. Once they landed, Poole learned that most of the military stores and food supplies had already been stripped from the warehouses along the Dvina opposite Archangel and were now safely in Bolshevik hands. This is one of a series of American postcards that was popular on the home front in 1918. Unfortunately, the reality was often quite different. Poor relations between the Alllied political and military leaders resulted from America's late entry into the Great War, plus General Pershing's prolonged training of the AEF in France prior to committing them to battle on the Western Front. The views of their leaders naturally found their way down to the ranks of the enlisted men, particularly those of the American and British forces. Also, having to serve under British command and supply in North Russia did not sit well with the men of the AEFNR. the Onega Front, where they would protect Allied communication and supply lines between the ice-free port of Murmansk and Archangel. General Poole and his staff thought that these objectives could be quickly achieved with the roughly 15,000 Allied soldiers and officers that would be available to them. Implicit in these plans was Poole's belief that the force of several thousand locally-raised "White" Russian troops already in Archangel could be greatly increased in numbers by the addition of local Russian peasants who would gladly volunteer to take up arms against the Bolsheviks. Map showing the location of towns, railways and rivers that figured in the fighting on the three main fronts. Poole's overly optimistic plans and assumptions started to fall apart almost immediately. On their way to Obozerskaya, Force B soon found themselves surrounded in Seletskoe by a force of 800 Red soldiers and sailors. During the breakout fighting, the Allies took their first casualties, six killed and six wounded. Force B reached Obozerskaya on August 31st and there they met stiff resistance from the "Bolo" forces who were already fending off Force A. After three days of fighting, during which the White Russian soldiers of Force B deserted, the remaining members of Force B broke off their attack and withdrew through the swamps, eventually reaching the Vologda railway line north of town on September 5th. From there they drifted up the railway back to Archangel, passing the American Third Battalion that had been sent down the line to relieve Force A, which had continued their attack on Obozerskaya. Poor communications had prevented the Americans from knowing that the Allies they were passing were men from Force B and that they had broken off their mission to attack the town from the east. This was the first of what would become numerous and often futile engagements with the Bolshevik enemy. The Third Battalion of the American 339th linked up with Force A and their armoured train on September 5th and together they would spend the next seven weeks engaging and chasing the Bolsheviks south from Obozerskaya. Artillery duels with the Bolshevik's armored train were punctuated with frequent mortar exchanges between the two sides. Occasionally, the Bolos would mount an infantry attack, but their rifle fire was often high and they would be mercilessly cut down by effective Allied fire from the Lewis and Vickers machine gun crews. Members of the US Army 310th Engineers worked tirelessly to rebuild burned bridges and repair bombed-out tracks. By October 16th, the Allies had advanced to Verst 445, which was not too many Versts from the railroad repair shops at Emtsa (one Verst equalled two-thirds of one mile). However, it was here at Verst 445 that the Allies' advance stalled out and this would remain the front lines on the long and narrow Railroad Front for the rest of the campaign. General Poole's objective of Vologda remained many more Versts to the south. A work train on the Vologda Railway Front. 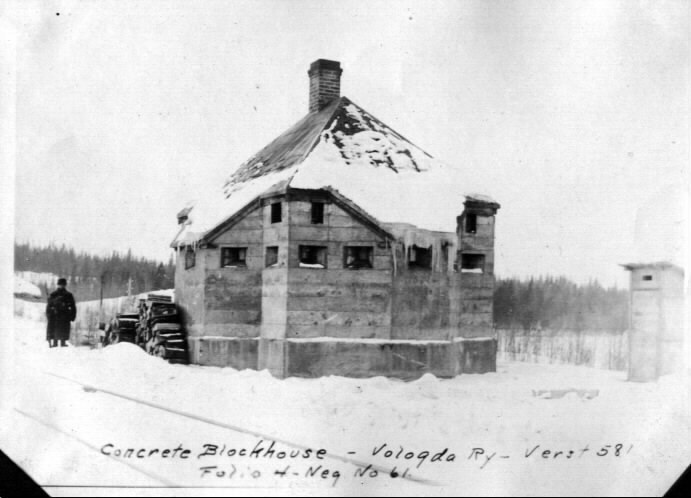 Concrete blockhouse at Verst 581 along the Vologda Railway. 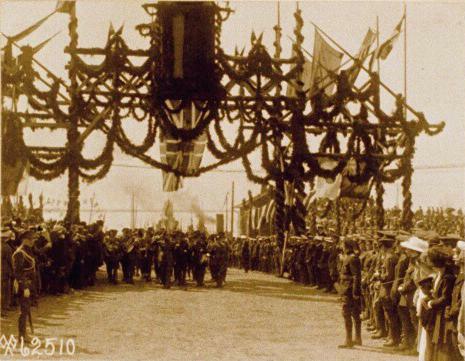 the arrival of the 310th Engineers in September 1918 during better weather. Meanwhile, the First Battalion of the 339th Infantry Regiment was making their way upstream on the Dvina River, tightly packed into dirty barges and carrying the influenza bug along with them. On September 12th, the battalion arrived at the town of Bereznik, which became the base for Allied troops on the Dvina River Front. So far, the only casualties had been 4 men who had died from the flu while on the barges. At Bereznik, the Americans joined Company A of the 10th Royal Scots, plus some White Russian and Polish units, and proceeded further upriver, advancing easily as the Bolshevik forces and their gunboats chose to retreat. The Bolos finally decided to make a stand at Seltso on September 19th and there they pinned down the advancing Allies, who took casualties until their Canadian artillery caught up with them on the following day, enabling them to take Seltso. However, the Bolos were advantaged with shallower draft gunboats and longer range artillery and thus the Allies were unable to hold Seltso for more than one day. 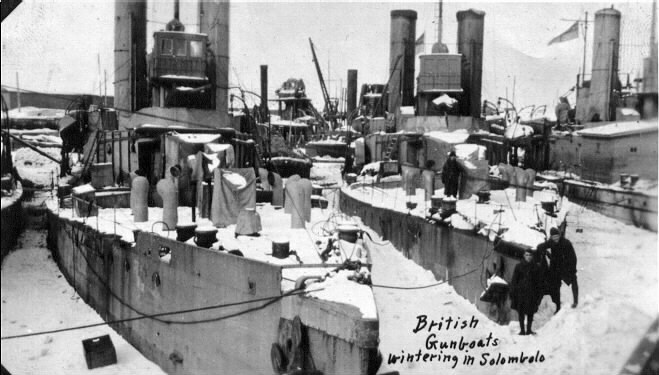 British gunboats wintering on the Dvina River in Solombola, near Archangel. On September 27th, the Allied HQ in Archangel sent orders to the forces on the Dvina to cease offensive actions and begin digging in for the winter. At this point, two companies of the American First Battalion were diverted from the Dvina and moved by barges up the Vaga River to Shenkursk. Worried that they might get trapped in the early ice on the Dvina, the captains of the British gunboats decided to retreat downstream so that they could safely lay up for the winter near Archangel. Over the next three weeks while the remaining Allied forces on the Dvina were preparing their winter defenses at Toulgas, there were several skirmishes as the Bolos became more aggressive with their gunboats and artillery. Finally on October 23rd, after several days of shelling Toulgas, the Bolos attacked the Allies defenses. Their outposts held, enabling the Allies to mount a counter attack. The Bolos soldiers were repulsed and they managed a disorderly retreat after suffering a hundred casualties. The Allies came through this without any casualties themselves, but they initially thought that Private Joseph Edvinson of Company B, 339th Infantry had been killed when his machine gun emplacement took a direct hit from a high explosive shell. The others in his gun crew retreated and reported that they had seen Edvinson flying through the air in one direction while the Lewis gun went the opposite way. Thinking that he had surely been killed, they waited until dark to retreive his body. As they approached the emplacement, they were shocked to see him pop out and hail them with, "Well, I think she is all right!". He had dusted himself off, collected his machine gun, cleaned and reassembled it and stuck to his post. For his actions, Pvt. Edvinson was awarded the British Military Medal. Over on the Onega Front, two platoons from Company H of the 339th Infantry arrived in the village of Onega by boat on September 15th, where they joined other Allied Forces which had held the town since July 31st. They quickly moved up the Onega River to occupy the village of Chekuevo, which was key to securing overland Allied communication and supply lines to Obozerskaya. On September 24th, the 115 Americans and 93 White Russians in Chekuevo were attacked by 350 Bolos, who were quickly driven off when their commander was killed by American machine gun fire. 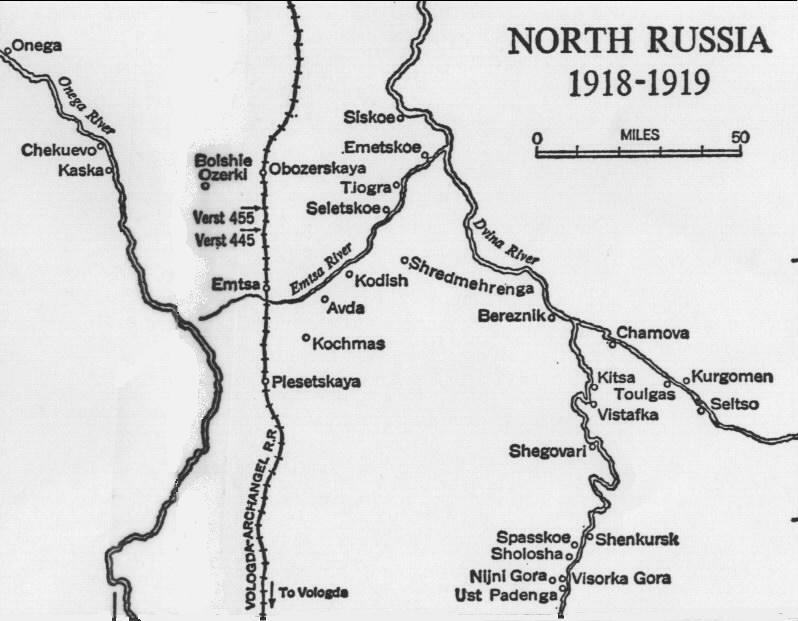 On September 30th, the garrison at Chekuevo was ordered to head south and cut off a Bolshevik force at Kaska that was organizing to attack Obozerskaya. Their mission collapsed shortly after the fighting began when the White Russian troops melted away, causing two American platoons to be pinned down for fourteen hours while they weathered the Bolo's fire, suffering six killed and three wounded. However, their attack on the enemy at Kaska was successful in the sense that it prevented the Bolos fom attacking Obozerskaya and caused them to retreat further up the Onega River. The next month was relatively quiet on the Onega Front save for the occasional encounters while on patrol. By mid-October it was becoming increasingly clear to some members of the HQ Staff in Archangel, as well as the High Command in London, that General Poole's plans were unrealistic. The Allies' maximum strength had finally been reached on September 30th when the last contingent of 3,000 British and 500 American troops had arrived in Archangel, with no prospects for additional replacement troops until spring. It was now increasingly obvious that the White Russians could not be relied upon in battle and that their ranks would never be expanded by volunteering peasants. Losses from disease were higher than expected, and it was clear that the Bolos were quite capable of inflicting combat casualties. The Bolos had demonstrated superior firepower on the Dvina Front and it was only through the fine work of the out-gunned men of the 67th & 68th Canadian Field Artillery that the Allied infantrymen stood any kind of chance of achieving their objectives. Looking at the larger picture, the long and narrow and widely-separated Fronts strained Allied communication and supply lines and were vulnerable to flanking attacks by the Bolsheviks forces. The Bolos also clearly held the major objectives of Vologda and Kotlas and knew better than the Allies how to traverse the forests, swamps and rivers along and between the Fronts. Against this backdrop, the British High Command in London sent Major General Sir Edmund Ironside to Archangel obstensibly to cover for Major General Poole while he took a leave in London. Poole departed Archangel on October 14th and Ironside threw himself into the job with a vigor that was in stark contrast to his predecessor. Unlike Poole, Ironside personally traveled to each of the Fronts to get a first-hand view of the situation. He quickly determined that the original strategy of an offensive campaign waged on multiple and widely separated Fronts against a numerically superior enemy could not be sustained with the available Allied forces. 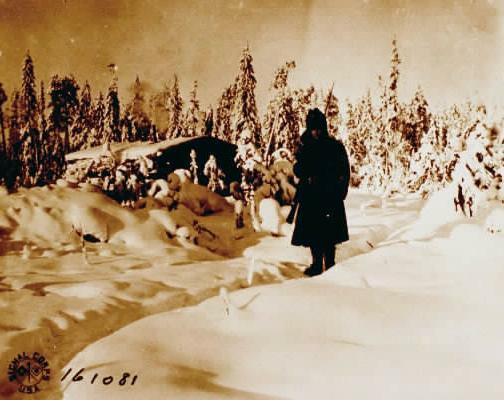 As the first heavy snows blanketed the North Russian countryside, orders were given along all Fronts to settle in and shift from an offensive to a defensive posture. Fortunately for all concerned, Major General Poole never did return to Russia from his leave. Ironsides' major objective was now to insure that the Allies would make it through the North Russian winter without getting driven into the White Sea by the Red Army. Blockhouse at Verst 455 surrounded by the forest, white with a new covering of snow. Corporal Hearn of Company I, 339th Infantry Regiment, 85th Division, U.S. Army. Taken at Verst 455 on the Vologda Railroad Front, Russia, Feb. 17, 1919. Despite their isolation, the Allied troops in North Russia tended to quickly hear and pass on every rumor regarding the end to the fighting on the Western Front. Many a soldier felt that once the Germans surrendered, their war would be over as well. However, before he left London, Ironside had been told that the Supreme War Council planned to continue the winter campaign in North Russia even after a German surrender. Certainly the Bolsheviks had no intentions of ending the fight against the Allied interventionists just because their former enemy, the Germans, might decide to surrender. Thus it came to be that one of the bloodiest days of fighting in North Russia occurred on November 11th, Armistice Day on the Western Front. Thanks to a brief thaw earlier in the week, the Bolos were able to move two of their gunboats down the Dvina River to Toulgas under the cover of darkness in the early morning hours of November 11th. As the gunboats opened fire on the village, one thousand Bolshevik soldiers pressed an attack on the outnumbered Allied troops. The men in the outposts retreated with their guns to the nearby blockhouse and together with the courageous, point-blank artillery fire brought to bear on the enemy by the 67th Canadian Field Artillery, the initial charge was repulsed. The fire directed from the blockhouse was well positioned to inflict heavy casualties on any Bolos who attempted to cross the eighty-foot bridge that led into the main part of the village. For four days, the Bolos attempted to take out the blockhouse through continuous shelling which heavily damaged it, but not enough to wipe out the defenders of the bridge. Finally on the 14th, coincidental with the passage of a severe cold front, elements of Company D staged a counter attack on the Bolos through the woods. These events caused the Bolo gunboats to withdraw and their demoralized troops to retreat. It was estimated that 500 Bolos had been killed at a cost of 28 Allied lives and 70 wounded. 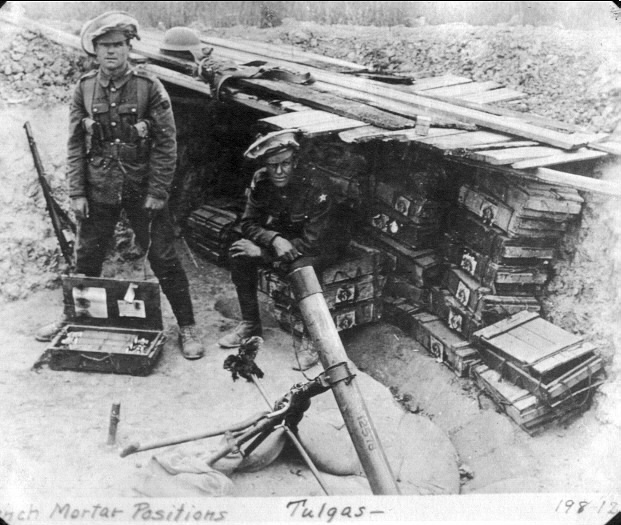 A trench mortar position near Toulgas. With the Allies adopting a defensive posture and settling in for the winter, the Bolshevik leaders were inclined to become more agressive. By now, they had realized the true size of the Allied interventionist forces and having seen how they were deployed, they felt that nature, time and numbers were on their side. In addition to Toulgas, during November the Bolos also attacked Allied forces at Verst 445 on the Railroad Front (Nov. 4th), Kodish (Nov. 5-8th) and Ust Padenga (Nov. 29th). The Bolos were unsuccessful in their efforts only at Verst 445 and they continued to pressure the forces along the Dvina River Front. In an effort to relieve that pressure, General Ironside approved a plan for a late December series of coordinated attacks along the Railroad Front with the objective of taking the town of Plesetskaya. French soldiers on snowshoes would depart from Obozerskaya and hike through the deep snow to make a rear attack on Emtsa. At the same time, the Forces at Verst 445 would break through and fight their way down the railroad to Emtsa. The Onega Force would make a diversionary move up the Onega River towards Plesetskaya and K Company would retake Kodish from the Bolos and with the help of a White Russian and British Force that would prevent a Bolo retreat, they would then all continue southwest towards Plesetskaya. The "railroad push", as it was known, was scheduled for December 29th -30th but word leaked to the Bolos when a group of White Russians deserted from Verst 445 and the Bolos immediately stepped up their artillery attacks in the area. The French were slowed to a crawl by the very deep snow and were exhausted and out of action before they ever got close to Emtsa. The Onega Force was stalled by a Bolo counterattack and despite the successful retaking of Kodish, the White Russian and British force failed to take their objective and the Bolshevik forces were able to retreat from Kodish towards their stronghold in Plesetskaya. With the "railroad push" plan in tatters, there was nothing more that the Allied commanders could do other than to call off the attack at Verst 445 and continue to occupy Kodish. This was the last offensive attempted by the Allies during the winter of 1918-1919. The Allies maintained a successful winter defense at Verst 445 while the Bolos continued to pressure the Allied Forces who were strung out and overextended along the Vaga River. A platoon of A Company, 339th Infantry barely avoided getting annihilated at Nijni Gora on January 19th and retreated to Visorka Gora. On January 20-22nd, the Bolos attacked Visorka Gora and A Company retreated to Shenkursk. On January 25th, all Allied forces in Shenkursk retreated in the middle of the night to Vistafka in the face of 3,000 advancing Bolshevik soldiers. In February, Kodish was relinquished to the Bolos and in late March, the Bolos launched their last major offensive of the winter at Bolshie Ozerki. Bolshie Ozerki was on the critical overland route linking Onega and Obozerskaya, along which all personnel, mail and supplies were transported to and from Murmansk during the months that the Dvina River at Archangel was frozen over. The Bolos advanced on Bolshie Ozerki from the south though the frozen swamps and on March 17th they attacked and wiped out the small French garrison in the village. The Onega and Railroad Fronts were now effectively cut off from each other. On March 23-24th, elements of the 339th Infantry attacked the Bolshevik forces in the village from both the east and west, but failed to dislodge them. Relief troops and Engineers were brought in to prepare for another assault on Bolshie Ozerki from the east. Before they were ready, the Bolshevik forces broke out of Bolshie Ozerki on March 31st and headed towards them with the objective of taking Obozerskaya on the railroad and cutting off the Allied forces who were still at Verst 445. Four miles east of Bolshie Ozerki, they engaged Company M of the 339th Infantry, who were sufficiently dug in to stop their advance and buy some time until reinforcements could arrive. Those reinforcements came on April 2nd in the form of Company H of the Onega Front who had linked up with the British 6th Yorkshire Regiment, which was newly-arrived from Murmansk and on their way to Archangel via Onega and Obozerskaya. They were able to attack the Bolos from the rear while Company M continued to block their path to Obozerskaya. Under severe pressure from the Allied forces and faced with rapidly warming temperatures, the Bolos retreated southward on April 5th. US Army Gen. Wilds P. Richardson On April 17, 1919, the icebreaker Canada fought its way up the Dvina River and landed at Archangel. On board was US Army General Wilds P. Richardson, who had been sent by his superiors from France to North Russia for the purpose of planning and executing an orderly withdrawal of the AEFNR at the earliest opportunity. Family and friends of the soldiers in the AEFNR had been clamoring for their return ever since Armistice Day by writing writing "Letters to the Editor" of their hometown newspapers and directly to their Congressmen. Most Americans knew nothing about the fighting that continued to involve US soldiers in far-away Russia, but their efforts were sufficient to raise the political awareness and to get the President and military brass to take the necessary steps to "bring our boys home". Armed with his marching orders, Richardson made a thorough tour of the AEFNR billets and barracks and made his on-the-ground assessment of what needed to be done. 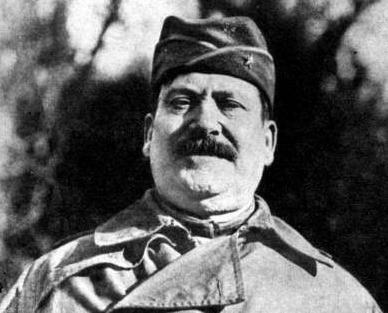 He also consulted with General Ironside to develop coordinated plans so that the other Allied forces, as well as the people in North Russia would not be left to the mercy of the Bolsheviks. With the spring thaw and river ice breakup, military operations either slowed to a crawl or had to be put on hold. This presented a good window of opportunity to safely remove the American and other Allied troops, who were then relieved by the volunteers of British North Russian Relief Force. The British North Russian Relief Force was made up of volunteer veterans of the Western Front who were told that this would be a quick, 6 month opportunity to make some good money and have a nice adventure. Many of the volunteers were Australian soldiers who were told that because of post-war shipping constraints, they would not be able to book passage home until early 1920 and this opportunity would give them something to do while they waited to go home. The first members of the Relief Force landed in Archangel on May 26, 1919 and by mid-July, the last of the AEFNR had sailed for France and the United States. While on their voyage home, the men of the AEFNR decided to start calling themselves "Polar Bears" and many a uniform received a silkscreened white polar bear patch on the left shoulder. In 1922, they organized a veteran's organization for former members of the AEFNR and named it the "Polar Bear Association". Beginning in 1922, their Association would hold biennial conventions. In 1929, they would organize an expedition back to North Russia under the auspices of the Veterans of Foreign Wars to recover the bodies of 86 of their fallen comrades. 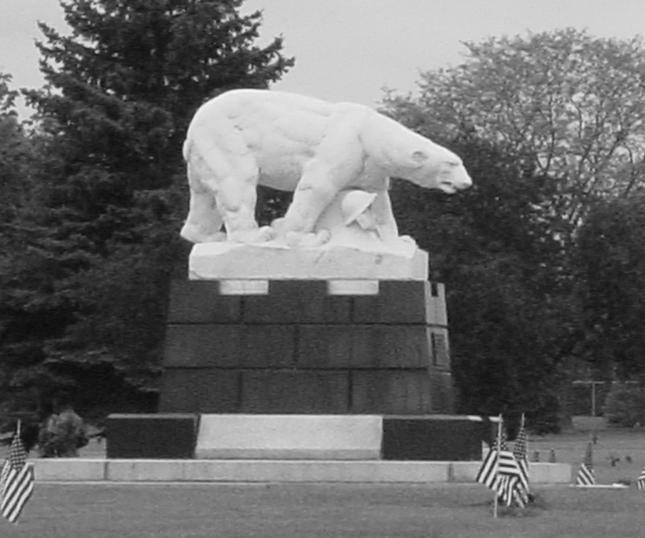 On Memorial Day, May 30, 1930, at White Chapel Cemetery near Detroit, Michigan, 45 of those bodies were interred alongside the Polar Bear Monument that was dedicated to their memory during the same ceremony. 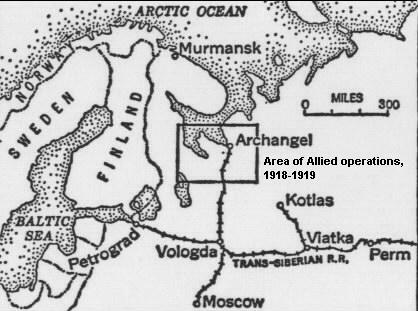 Meanwhile, by July 1919, the British North Russian Relief Force had shipped their full complement of volunteers to the Archagel region. Besides covering the withdrawal of the departing troops and replacing them in the field, the Relief Force also trained the White Russian Army so they could cover their own withdrawal and then defend the local populace against the Bolsheviks after they had returned to England. 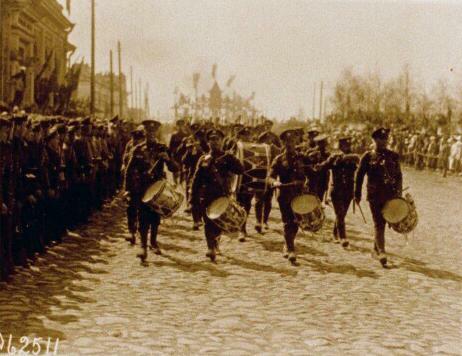 The British North Russian Relief Force began their withdrawal in September 1919 and one month later, the volunteer White Russian Army was on their own. Archangel eventually fell to the Bolsheviks in February of 1920. Most Americans (and I would wager that most British citizens) do not know that their country's soldiers fought the Russian Communists on their own soil. However, the story of these first battles of the "cold war" are still taught to every Russian schoolkid. During his tour of the USA in 1959, Nikita Krushchev said, "We remember the grim days when American soldiers went to our soil, headed by their generals, to help the White Guard.....strangle the new revolution....Never have any of our soldiers been on American soil, but your soldiers were on Russian soil. These are the facts." Visitors to the "Polar Bear Memorial Association" website since July 6, 2002. 934 of these visitors and 1,143 page views were recorded between July 6, 2002 and May 27, 2004 when this new site meter was installed.